This article is about the national holiday. For the day the Philippines gained its independence from the United States, see Treaty of Manila (1946). Independence Day (Filipino: Araw ng Kasarinlan; also known as Araw ng Kalayaan, (or "Day of Freedom") is an annual national holiday in the Philippines observed on June 12, commemorating the Philippine Declaration of Independence from Spain on June 12, 1898. Since 1962, it has been the country's National Day. The day of celebration of independence varied throughout the nation's history. The earliest recorded was on April 12, 1895, when Andres Bonifacio, along with Emilio Jacinto, Restituto Javier, Guillermo Masangkay, Aurelio Tolentino, Faustino Manalak, Pedro Zabala and few other katipuneros went to Pamitinan Cave in Montalban, Rizal to initiate new members of the Katipunan. 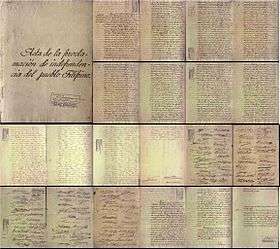 Bonifacio wrote Viva la independencia Filipina! or Long Live Philippine independence on walls of the cave to express the goal of their secret society. Bonifacio also led the Cry of Pugad Lawin, which signals the beginning of Philippine Revolution. Members of the Katipunan, led by Andres Bonifacio, tore their community tax certificates (cedulas personales) in protest of Spanish conquest. In 1896 the Philippine Revolution began and in December 1897 the Pact of Biak-na-Bato, an agreement between the Spanish colonial government and the revolutionaries, established a truce. Under its terms, Emilio Aguinaldo and other revolutionary leaders went into exile in Hong Kong. The Philippines failed to win international recognition of its independence, including by the United States of America or by Spain. The Spanish government later ceded the Philippine archipelago to the United States in the 1898 Treaty of Paris. The Philippines Revolutionary Government did not recognize the treaty and the two sides subsequently fought the Philippine–American War. The United States of America granted independence to the Philippines on July 4, 1946 through the Treaty of Manila. July 4 was chosen as the date by the United States because it corresponds to the United States' Independence Day, and that day was observed in the Philippines as Independence Day until 1962. On May 12, 1962, President Diosdado Macapagal issued Presidential Proclamation No. 28, which declared June 12 a special public holiday throughout the Philippines, "... in commemoration of our people's declaration of their inherent and inalienable right to freedom and independence." On August 4, 1964, Republic Act No. 4166 renamed July 4 holiday as "Philippine Republic Day", proclaimed June 12 as "Philippine Independence Day", and enjoined all citizens of the Philippines to observe the latter with befitting rites. Prior to 1964, June 12 had been observed as Flag Day in the country. In 1965 President Diosdado Macapagal issued Proclamation No. 374, which moved National Flag Day to May 28 (the date the Philippine Flag was first flown in battle in Alapan, Imus, Cavite in 1898). In 1994, President Fidel V. Ramos issued Executive Order No. 179, extending the celebration period extended period to range from May 28 to Philippine Independence Day on June 12, ordering government departments, agencies, offices, government owned and controlled corporations, state agencies, and local government units, and even private establishments, to prominently display the National Flag in all public buildings, government institutions, and official residences during this period, and ordering the Department of Education, in coordination with the private sector, non-government organizations, and socio-civic groups, to enjoin the prominent display of the National Flag in all public squares and, whenever practicable, in all private buildings and homes in celebration of national independence. The day is spent with family bonding with friends and relatives and in either outdoor and indoor activities. All government offices and schools are closed as are private enterprises save for commercial establishments. As required by law the Flag of the Philippines, first flown on that day in 1898, is displayed in homes and establishments from as early as May 28, Flag Day, or on a selected date of May by the National Historical Commission of the Philippines, which serves as the organizer of the celebrations, to the 30th of the month. Fireworks displays are the norm. Kawit, Cavite holds a yearly commemorative act with the flag raising at the Aguinaldo Shrine and the reading of the Philippine Declaration of Independence. Worldwide, Filipinos will gather on June 12 or a date close to it to publicly celebrate, sometimes with a Philippine Independence Day Parade. A ceremony in Manila serves as the official festivities as well as the simultaneous raising of the National Flag of the Philippines in various historical places nationwide. Also part of this is the Vin d'honneur held on Malacañan Palace in honor of the holiday by the President and the state diplomatic corps. 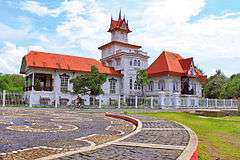 2015 saw a break in the tradition as the holiday Vin d'honneur was held outside of Manila in the historic Casa Real in Iloilo City for the first time. The festivities begin in Manila's Rizal Park or in selected historical landmarks of the nation as is the trend since 2011 in which the President of the Philippines, the Vice President of the Philippines, members of the state Cabinet and Congress, members of government organizations and state employees, representatives of the uniformed services (Armed Forces, National Police, Coast Guard, Bureau of Fire Protection and Bureau of Jail Management and Penology), youth uniformed organizations and business entities, veterans, people from the nation's different religions and ethic minorities, the state diplomatic corps, honored dignitaries and the general public begin the national commemorations through a simultaneous raising of the National Flag at 8 in the morning preceded by holiday honors by the AFP to the President (the flag is raised to the tune of the national anthem, Lupang Hinirang, first performed on this day in 1898) followed by wreath laying ceremonies and the Presidential holiday address. On June 12, 1998, the nation celebrated its hundredth year of independence from Spain. The celebrations were held simultaneously nationwide by then President Fidel V. Ramos and the Filipino diaspora. The National Centennial Commission was headed by former Vice President and Prime Minister Salvador Laurel. The body organized and presided over all events around the country. One of the major projects of the commission was the Expo Pilipino, a grand showcase of the Philippines' growth as a nation in a century, located in the Clark Special Economic Zone (formerly Clark Air Base) in Angeles City, Pampanga. Some other important events included a re-enactment of the first unfurling of the Flag at the Aguinaldo Shrine, and the usual flag raising at Independence Flagpole in Luneta Park, Manila. ↑ President of the Philippines. "DECLARING THE REGULAR HOLIDAYS, SPECIAL (NON-WORKING) DAYS, AND SPECIAL HOLIDAY (FOR ALL SCHOOLS) FOR THE YEAR 2013". PROCLAMATION NO. 459. Official Gazzette, Philippine National Government. Retrieved July 23, 2013. ↑ Halstead, Murat (1898). The Story of the Philippines and Our New Possessions, Including the Ladrones, Hawaii, Cuba and Porto Rico. p. 126. ↑ Agoncillo,, Teodor A. (1990). History of the Filipino people ([8th ed.]. ed.). Quezon City: Garotech. p. 157. ISBN 978-9718711064. ↑ De Ojeda, Jaime. "The Spanish–American War of 1898: A Spanish View." Library of Congress: Hispanic Division. ↑ Koenig, Louis W. (1982). "The Presidency of William McKinley" by Lewis L. Gould: Review. Presidential Studies Quarterly, Vol. 12, No. 3: pg. 448. ↑ "Proclamation No. 28, s. 1962". Official Gazzette of the Government of the Philippines. May 12, 1962. ↑ Executive Order No. 179, s. 1994, May 24, 1994, Official Gazette of the Philippine Government. ↑ "Remembering The June 12, 1998 Philippine Centennial Celebration at Roxas Boulevard". Magnakultura.multiply.com. Retrieved June 5, 2012.